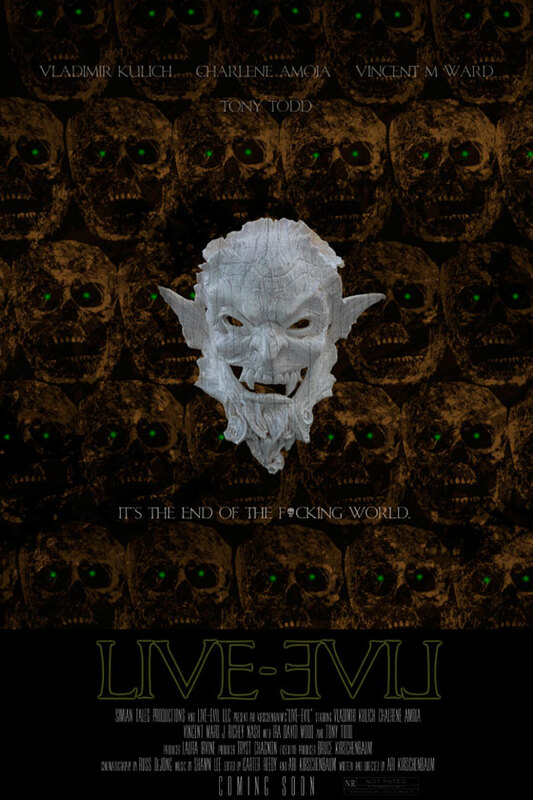 We're just days away from Halloween and the Comikaze exclusive premiere of Live-Evil! Kick off your haunted evening with an appropriate tale of supernatural evil and zombies on Saturday, October 31st at 5:30 PM in room 515B. It's basically right over the West Hall of the Los Angeles Convention Center. So when you go upstairs to the third floor, just go to the right for a while! We'll have trivia, prizes and giveaways like tee shirts and signed posters. The panel has grown immensely as we're joined by writer/director Ari Kirschenbaum, leading man Vladimir Kulich (The 13th Warrior), leading lady Charlene Amoia (How I Met Your Mother), Vincent M. Ward (The Walking Dead), J. Richey Nash, Carter and Ed Ricker. Co-star Tony Todd (Candyman, The Rock) is currently working outside of Los Angeles but recently popped up for a screening at Santa Fe's Dark Frame Film Festival. Admission to the west coast premiere is included in your Comikaze Day Pass for Saturday. It's going to be a fun day as Comikaze is really coming into it's own with tons of screenings, panels, contests and special guests along with the giant exhibit floor and Artist Alley. See you there!